For those not of Europe, or those even further removed from the sporting world than we are, the ‘Euros’ are currently on. This means Ireland collectively goes down to the pub a few nights a week to watch our national team play soccer. 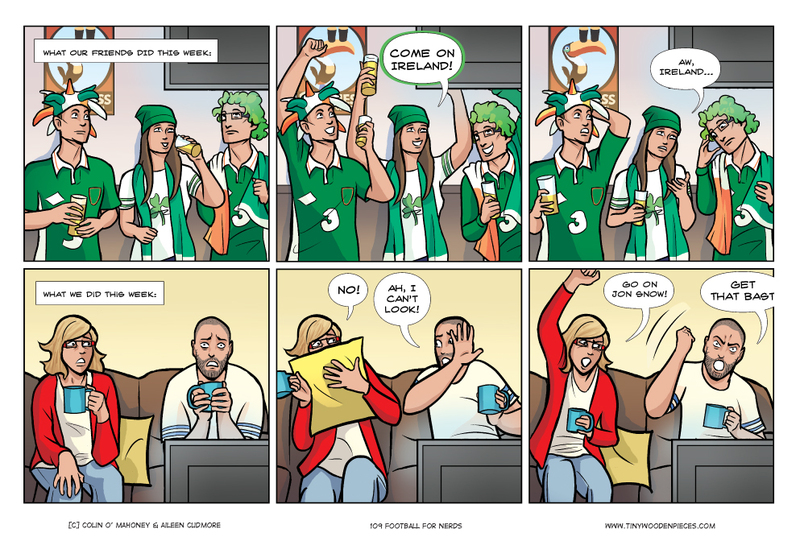 At the time of writing the comic, Ireland had managed one defeat and a draw. However, by the time of writing this blog post, they had added a victory to this tally (1-0, exciting stuff, right?). This has in fact allowed them to qualify for the next stage, so I guess the competition could not accurately be described as fierce. Nonetheless, even the most die-hard fan would admit that getting to the this stage was far from likely, so it is a big deal for a country not given to major sporting success in this field. The media coverage, and national interest, has felt ubiquitous. Anyway, no-one comes here to read about soccer, you’re all here to read about board games. So I guess I should apologise now, because I’m far too excited about Game of Thrones to talk about board games this week. There genuinely was whooping and shouting and cheering in our house. That was not exaggerated for comic effect. That was one of the most tense, grim, action-packed, exhausting and satisfying hours of television I have ever seen. Mostly thanks to what was probably the best battle scene ever filmed for film or television. From when Ramsay sent Rickon running across the battlefield, until Jon Snow grappled him to the ground, it didn’t let up for a minute. As absorbed as I was in the episode, I don’t think I realised exactly how invested I had become in Game of Thrones until the Stark Banner was unfurled again at Winterfell. I couldn’t then help but join in the cheering, in that sense of justice, relief, finality and bitterly won success. The only board game related note that I can add to this is that we will definitely be playing the Game of Thrones board game the next chance we get. Although it will be a little strange to visit a Westeros so changed, holding hands of cards filled with characters long since deceased. It will almost be nostalgic, if a little tragic. Thanks for the tip on the new Tim Flowers game, I’ll definitely check that out. His previous games look great, even if I still haven’t managed to play any of them. I guess that just leaves you …. I don’t know, videos of cats on the internet as a topic of conversation? Tough break…. How did you get on in the top 8 in XWing last weekend? We headed back home before it finished up. Cat videos are the expertise of my better half. I defer to her on all such matters. Masterchef Australia is my sole tv vice, these days. Xwing finished around 11pm… long day. I took first and a fancy trophy for my efforts, as well as a bye into Nationals in the UK and a zombie like fatigue for the trip home. Amazing competitors in the top 8. Congratulations! I’m delighted for you, man. That must have been hard won. You gonna go to the UK nationals? Thinking about it. It is on a weekend I’m off, but I’m on nights for it again, so it could well be a similar 40+ hours awake marathon if I do it. It’d be a shame to waste the opportunity though, so I’m still very tempted. Hair dye is not that common, in fairness. Having said that, around Patrick’s day and sporting events like this, it’s not that uncommon either. We do celebrating and festivities quite well, I like to think.